Ten Speed Press, 9781607741916, 416pp. In her latest cookbook, Deborah Madison, America's leading authority on vegetarian cooking and author of Vegetarian Cooking for Everyone, reveals the surprising relationships between vegetables, edible flowers, and herbs within the same botanical families, and how understanding these connections can help home cooks see everyday vegetables in new light. For over three decades, Deborah Madison has been at the vanguard of the vegetarian cooking movement, authoring classic books on the subject and emboldening millions of readers to cook simple, elegant, plant-based food. This groundbreaking new cookbook is Madison’s crowning achievement: a celebration of the diversity of the plant kingdom, and an exploration of the fascinating relationships between vegetables, edible flowers, herbs, and familiar wild plants within the same botanical families. Destined to become the new standard reference for cooking vegetables, Vegetable Literacy shows cooks that, because of their shared characteristics, vegetables within the same family can be used interchangeably in cooking. It presents an entirely new way of looking at vegetables, drawing on Madison’s deep knowledge of cooking, gardening, and botany. For example, knowing that dill, chervil, cumin, parsley, coriander, anise, lovage, and caraway come from the umbellifer family makes it clear why they’re such good matches for carrots, also a member of that family. With more than 300 classic and exquisitely simple recipes, Madison brings this wealth of information together in dishes that highlight a world of complementary flavors. Griddled Artichokes with Tarragon Mayonnaise, Tomato Soup and Cilantro with Black Quinoa, Tuscan Kale Salad with Slivered Brussels Sprouts and Sesame Dressing, Kohlrabi Slaw with Frizzy Mustard Greens, and Fresh Peas with Sage on Baked Ricotta showcase combinations that are simultaneously familiar and revelatory. 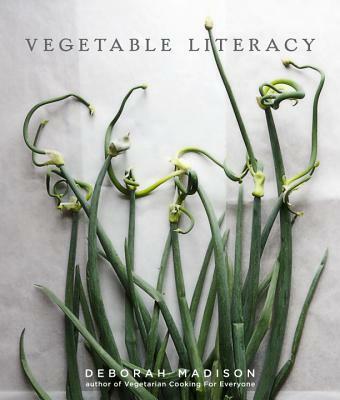 Inspiring improvisation in the kitchen and curiosity in the garden, Vegetable Literacy—an unparalleled look at culinary vegetables and plants—will forever change the way we eat and cook.